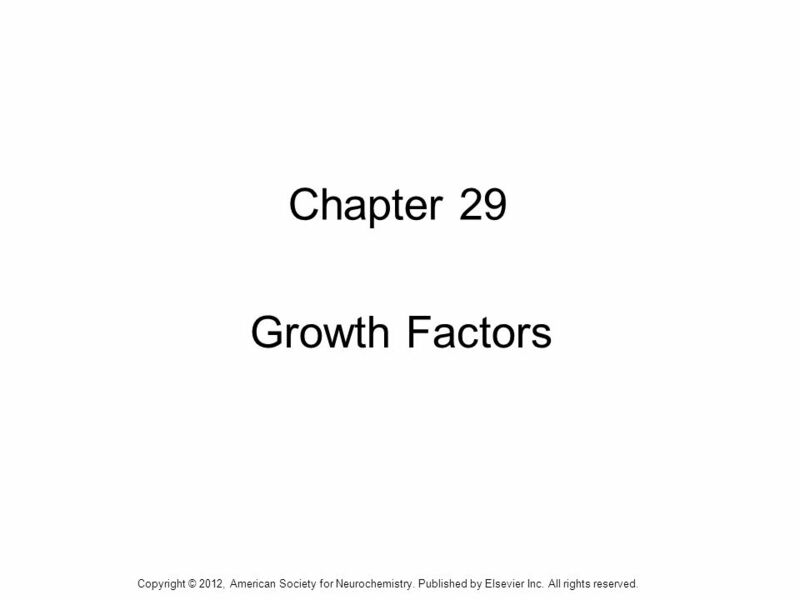 1 Chapter 29 Growth Factors Copyright © 2012, American Society for Neurochemistry. Published by Elsevier Inc. All rights reserved. 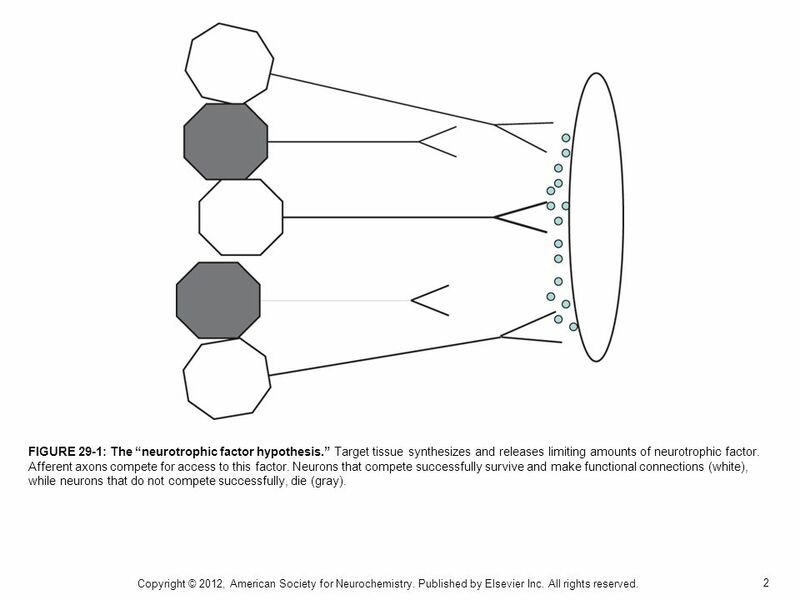 1 1 Chapter 29 Growth Factors Copyright © 2012, American Society for Neurochemistry. Published by Elsevier Inc. All rights reserved. 2 2 FIGURE 29-1: The neurotrophic factor hypothesis. Target tissue synthesizes and releases limiting amounts of neurotrophic factor. Afferent axons compete for access to this factor. Neurons that compete successfully survive and make functional connections (white), while neurons that do not compete successfully, die (gray). Copyright © 2012, American Society for Neurochemistry. Published by Elsevier Inc. All rights reserved. 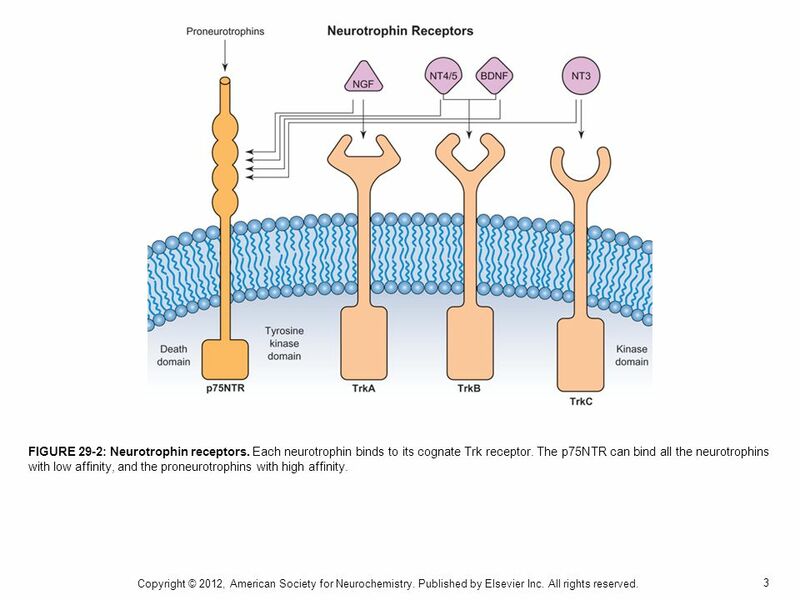 3 3 FIGURE 29-2: Neurotrophin receptors. Each neurotrophin binds to its cognate Trk receptor. 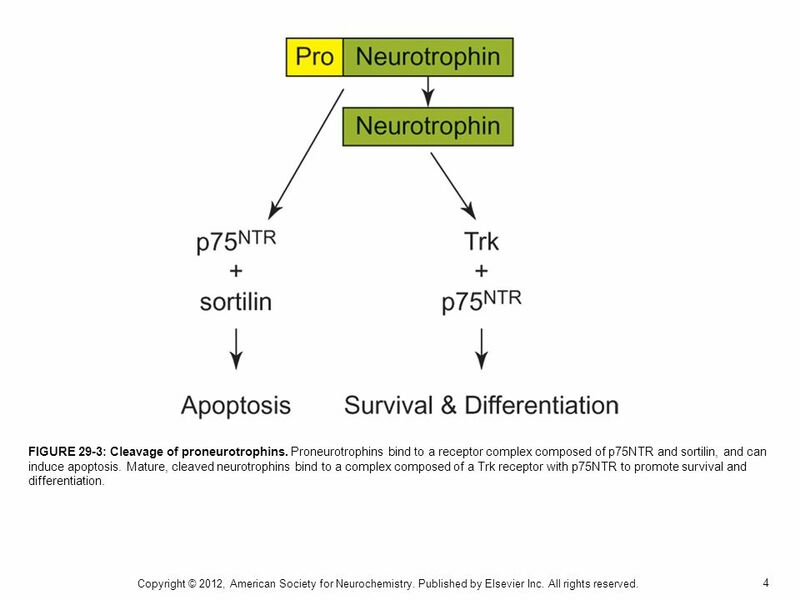 The p75NTR can bind all the neurotrophins with low affinity, and the proneurotrophins with high affinity. Copyright © 2012, American Society for Neurochemistry. Published by Elsevier Inc. All rights reserved. 4 4 FIGURE 29-3: Cleavage of proneurotrophins. Proneurotrophins bind to a receptor complex composed of p75NTR and sortilin, and can induce apoptosis. Mature, cleaved neurotrophins bind to a complex composed of a Trk receptor with p75NTR to promote survival and differentiation. Copyright © 2012, American Society for Neurochemistry. Published by Elsevier Inc. All rights reserved. 5 5 FIGURE 29-4: Trk receptor signaling. Signaling by Trk receptors activates three well-characterized pathways, the PI 3 K-Akt pathway, the ras-MAPK pathway and recruitment of PLC. Copyright © 2012, American Society for Neurochemistry. Published by Elsevier Inc. All rights reserved. 6 6 FIGURE 29-5: p75NTR signaling. Activation of p75NTR recruits adapter proteins to the receptor, leading to JNK phosphorylation, mitochondrial release of cytochrome c, and activation of the intrinsic caspase cascade. Copyright © 2012, American Society for Neurochemistry. Published by Elsevier Inc. All rights reserved. 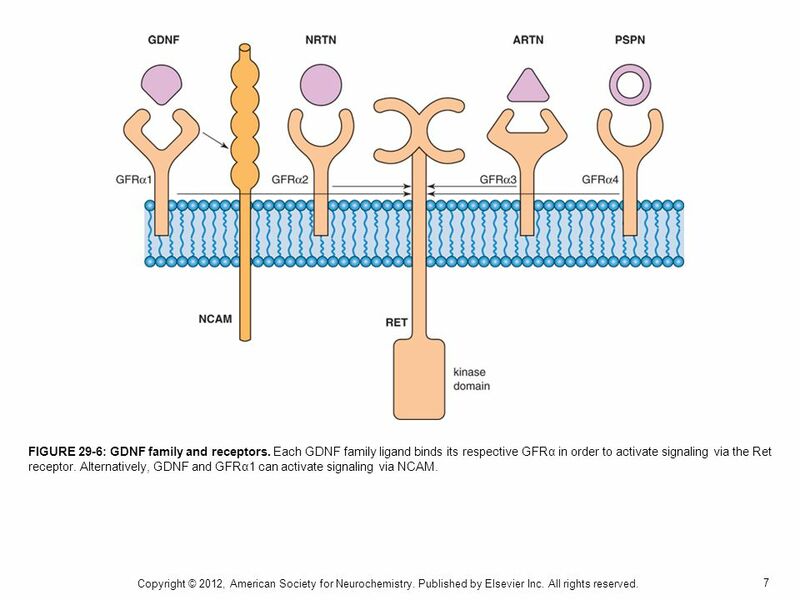 7 7 FIGURE 29-6: GDNF family and receptors. Each GDNF family ligand binds its respective GFRα in order to activate signaling via the Ret receptor. Alternatively, GDNF and GFRα1 can activate signaling via NCAM. Copyright © 2012, American Society for Neurochemistry. Published by Elsevier Inc. All rights reserved. 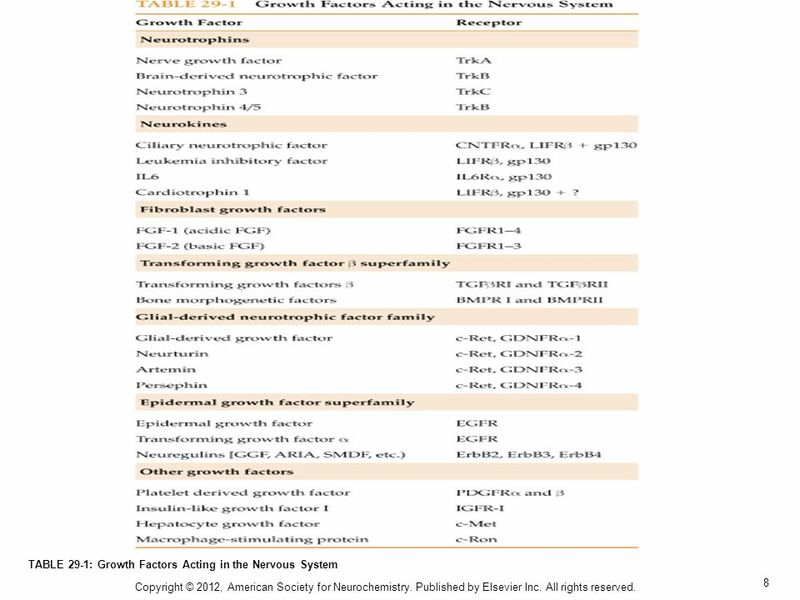 8 8 TABLE 29-1: Growth Factors Acting in the Nervous System Copyright © 2012, American Society for Neurochemistry. Published by Elsevier Inc. All rights reserved. Download ppt "1 Chapter 29 Growth Factors Copyright © 2012, American Society for Neurochemistry. Published by Elsevier Inc. All rights reserved." 1 Chapter 37 Apoptosis and Necrosis Copyright © 2012, American Society for Neurochemistry. Published by Elsevier Inc. All rights reserved. 1 Chapter 24 Calcium Copyright © 2012, American Society for Neurochemistry. Published by Elsevier Inc. All rights reserved. 1 Chapter 22 Cyclic Nucleotides in the Nervous System Copyright © 2012, American Society for Neurochemistry. Published by Elsevier Inc. All rights reserved. 1 Chapter 14 Catecholamines Copyright © 2012, American Society for Neurochemistry. Published by Elsevier Inc. All rights reserved. 1 Chapter 25 Serine and Threonine Phosphorylation Copyright © 2012, American Society for Neurochemistry. Published by Elsevier Inc. All rights reserved. 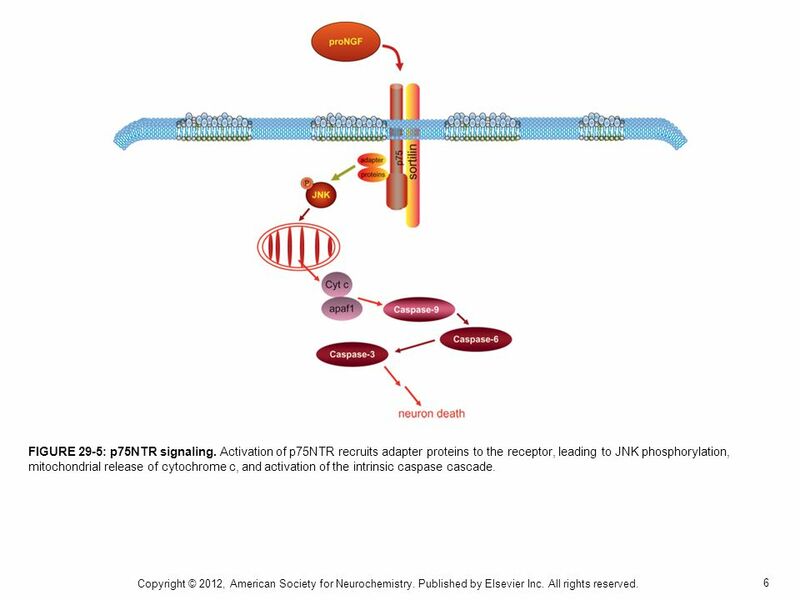 1 Chapter 26 Tyrosine Phosphorylation Copyright © 2012, American Society for Neurochemistry. Published by Elsevier Inc. All rights reserved. 1 Chapter 54 Pain Copyright © 2012, American Society for Neurochemistry. Published by Elsevier Inc. All rights reserved. 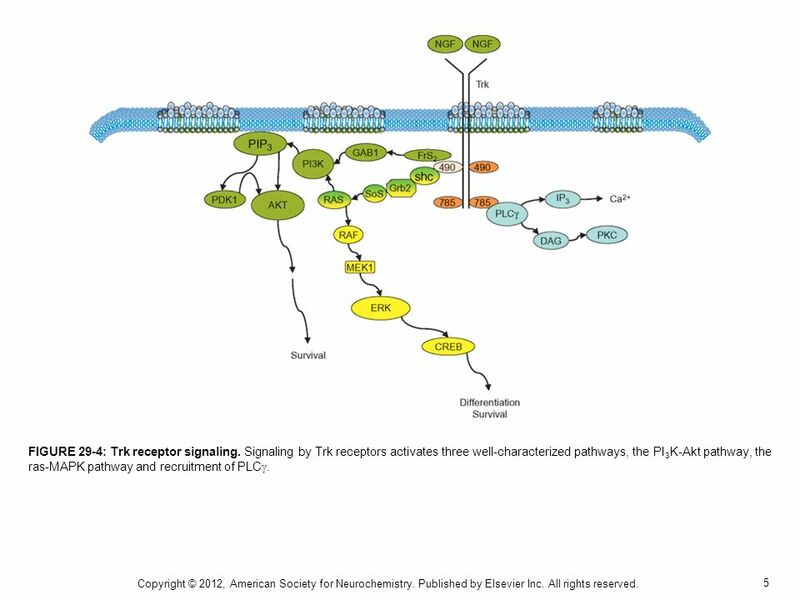 1 Chapter 19 Purinergic Signaling Copyright © 2012, American Society for Neurochemistry. Published by Elsevier Inc. All rights reserved. 1 Chapter 60 Neurobiology of Severe Mood and Anxiety Disorders Copyright © 2012, American Society for Neurochemistry. Published by Elsevier Inc. All rights. 1 Chapter 52 Molecular Basis of Olfaction and Taste Copyright © 2012, American Society for Neurochemistry. Published by Elsevier Inc. All rights reserved. 1 Chapter 41 Genetics of Neurodegenerative Diseases Copyright © 2012, American Society for Neurochemistry. Published by Elsevier Inc. All rights reserved. 1 Chapter 38 Inherited and Neurodegenerative Diseases Copyright © 2012, American Society for Neurochemistry. Published by Elsevier Inc. All rights reserved. 1 Chapter 40 The Epilepsies: Phenotypes and Mechanisms Copyright © 2012, American Society for Neurochemistry. Published by Elsevier Inc. All rights reserved. 1 Copyright © 2010, Elsevier Inc. All rights Reserved Fig 4.1 Chapter 4. Copyright © 2011, Elsevier Inc. All rights reserved. Chapter 14 Author: Julia Richards and R. Scott Hawley. Chapter 12 Chapter 12 Parathyroid Hormone and Parathyroid Hormone-Related Protein Copyright © 2013 Elsevier Inc. All rights reserved. 1 Chapter 77 - Ischemic Renal Disease Copyright © 2013 Elsevier Inc. All rights reserved.